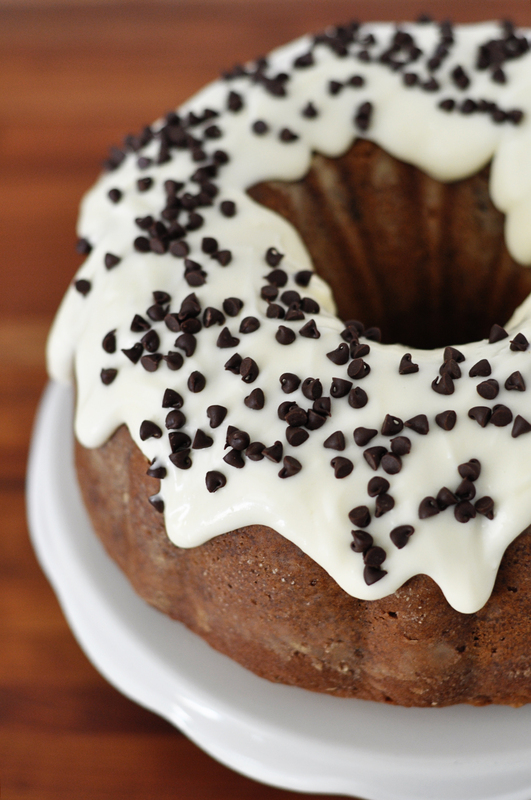 Chocolate Chip Sour Cream Bundt Cake - Real life, on purpose. Last month my friend Janssen hosted a tiny birthday lunch for our friend Kayla. I was instructed to make the cake. After scouring my too-large Pinterest board of cake recipes, I decided instead to adapt an old favorite that I hadn’t made in years. I know I shared the original way back when this blog was just a wee babe. Pretty sure I converted that post (along with many far more embarrassing ones) back to a draft because I can’t find it when I search the site. Oh well. Perfect time to update and reshare, right? Anyway, when I converted her recipe to a chocolate chip sour cream bundt cake, I used full fat everything…which I’m sure would appall Karen. Given the choice between margarine and butter, though, I’m with Paula Deen: gimme the butter every time. And judging from the silence that fell over the group once everyone had their own slice, moms and kids alike approved of my choice. By the way, there are few things that raise my blood pressure faster than turning out a bundt cake that I am supposed to bring to an event and praying it doesn’t stick to the pan. (We’ve seen how that goes and it ain’t pretty.) My current strategy: a real thick layer of cooking spray + a good dusting of flour. And even if that doesn’t work, it still tastes good. One final thought. In case you hadn’t heard, Mother’s Day is this Sunday! 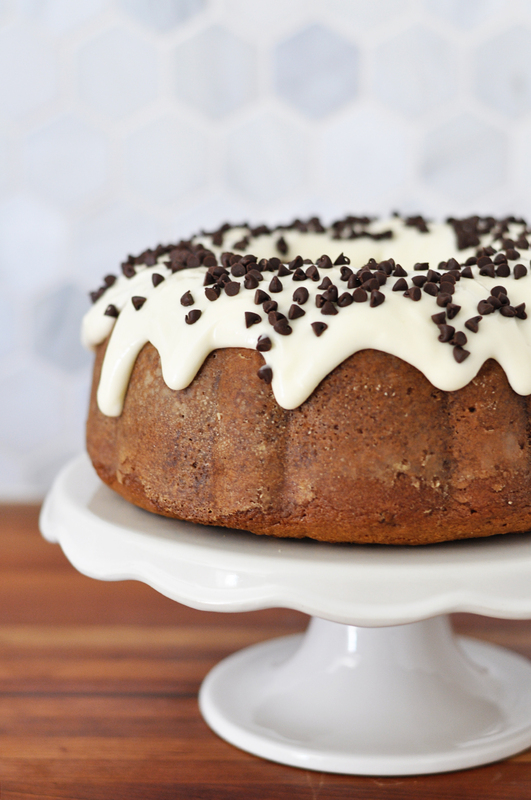 Might I suggest making a chocolate chip sour cream bundt cake for dear old Mom? She’d be so proud of your culinary prowess. And I bet she’d share. In a medium bowl, combine sour cream and baking soda. Set aside. It may or may not get foamy but the mixture will get larger in volume. Cool for 20 minutes or so, then turn out onto serving plate. 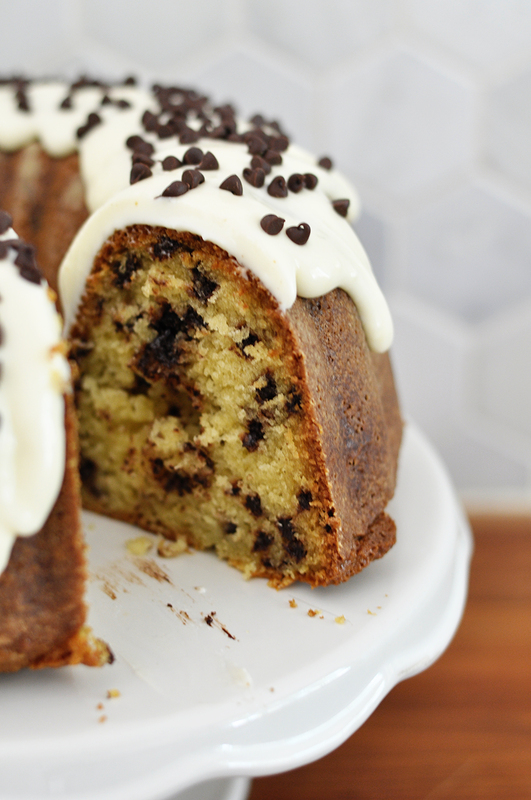 Top with frosting and remaining mini chocolate chips. Serve warm or cool. Store in airtight container at room temperature. Combine all ingredients in a small bowl and beat with a hand mixer until smooth. Add milk or powdered sugar to reach desired consistency. 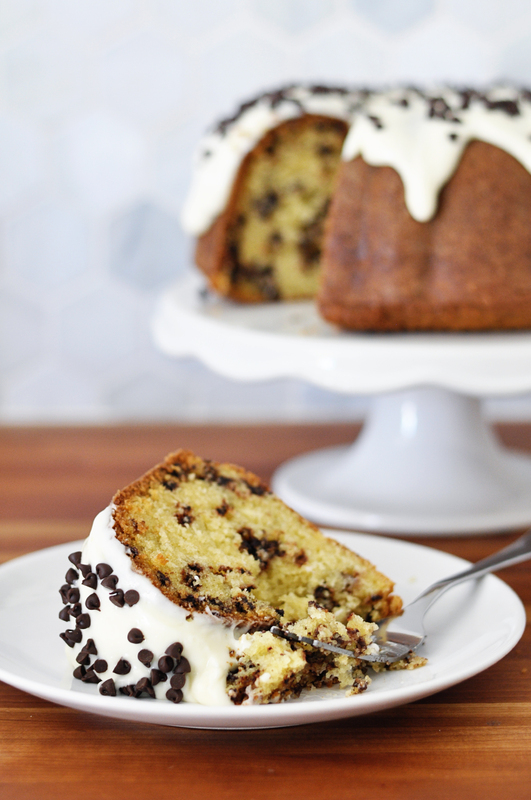 Spread or drizzle on cooled cake and sprinkle mini chocolate chips on top. Dear old mom would love this. Wow! Your recipe is good and I planning to make this cake for my kid’s birthday party. Will see if it’s a success I’ll let you know. Thanks! !